An inline static mixer that resists plugging from calcium build up. The Inline Static Mixer Model 2850 is the ideal replacement for plugged up mixers. A common problem with conventional static mixers is that, when caustics are added, calcium deposits build up on the mixer and block the flow of liquids. This inline static mixer offers a high performance solution that improves mixing and resists calcium build up. The plate’s singular orifice, with cloverleaf-shaped tabs, generates high-shear mixing. 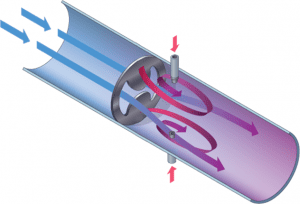 Moving the injection port 1/2 diameter downstream in the pipe from the mixer yields a 200% reduction in the concentration of the injected caustic. CFD Analysis discusses moving injection port .5D downstream. 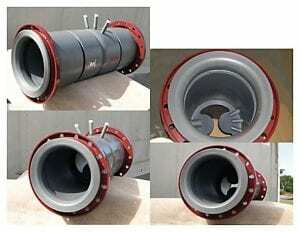 For an easy and affordable drop-in solution to an infrastructure upgrade, the static mixer is custom built inside a pipe that matches the exact dimensions and materials of the pipe being replaced. The Inline Static Mixer 2850 comes with a choice of orifice sizes, from .7 Beta to .9 Beta, and up to six injection ports. The larger the orifice, the less plugging, nesting or fouling occurs. Depending on orifice size, CoV ranges from .008 to .05 and K-Values from 32.59 to 6.78. The fixed plate mixes by a combination of alternate vortex shedding and intense shear zone turbulence to achieve >98% dispersion within 10 pipe diameters downstream. 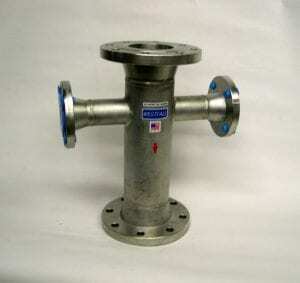 The Inline Static Mixer can be equipped with any type of flange. Choose 2” to 120” (50.8mm to 3048mm) pipe size in 316 stainless steel, titanium, Hastelloy®, Kynar®, Polypropylene or Fluoropolymer coating. Corrosion resistant materials include titanium, zirconium or Hastelloy. Up to six injection ports can be added. Designed for high-viscosity fluids, this mixer features Westfall’s signature plate mixer placed in line just upstream of the injection ports. This allows the viscous fluids to enter the mixer at the point of greatest turbulence. Mixing is complete within 10 pipe diameters. Choice of openings are available from .7 Beta to .9 Beta. Because of the high viscosity, this customer chose the largest opening.